The previous two articles talked about planning your electrical safety program, and included hazard identification and risk assessment. This article is going to talk about putting your plan into action. The next section to include in your own electrical safety program is Implementation. As they saying goes, you’ve planned your work and now you have to work your plan. This involves checking all of your available resources (electrical system data, personnel, equipment, cash, etc.) and getting to work at making your working area safe. This phase should outline any precautions and preventative measures that need to be taken, such as setting up warning signs and labels, and making sure all equipment meets the safety regulations defined in the planning phase. You’ll also want to make sure you have enough personal protective equipment and insulated tools and have a way to obtain them and a method for approving them. PPE should be examined before each use and should be replaced if there are any abnormalities or damage to the PPE. 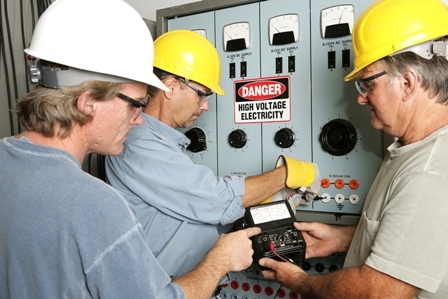 On the job training is an important part of your electrical safety program. The implementation phase is also where you’ll outline your electrical safety program’s training plan and schedule. Training methods are varied and can include a healthy mix of classroom and on the job training. Job specific training should be mandatory before performing any new job. If the job is performed infrequently, you should establish a set period of time that can pass before it becomes necessary for an employee to repeat the training for that particular job. Something to stress here is diligence: complacency with work can be just much of a hazard as anything else. Everyone should always be up to date on their training for any job. Speaking of jobs, you’ll also want to outline processes for job planning meetings. These should take place before a job dealing with energized equipment begins. You need to determine who should hold the meetings, identify the hazards involved with the job, perform a risk assessment, develop a plan for actually performing the job, and identify any PPE or tools required to complete the job. An example can be found in CSA Z462. You’ll also want your electrical safety program to stress the importance of clear communication and awareness here. If an employee doesn’t understand something related to the work they are going to be doing, they should be encouraged to ask questions. Any questions should only be answered by qualified individuals who are sure that they know the answer. A good rule of thumb is that if you don’t know something, confess to not knowing and find someone who does. Never give a false or incomplete answer. Likewise, if a job is going to be performed around heavy equipment, make sure the communication protocols are clearly defined so that people don’t misinterpret information: confusion will lead to human error. And please, try to avoid jargon. You can find our article about the evils of jargon in the workplace here. Finally, your electrical safety program will need to explain your emergency prevention and response system for when things eventually do go wrong. All employees should have some basic form of emergency training, but job specific emergency responses (such as responses for accidents around high voltage equipment) should be outlined. Now that you’ve got an idea of how to implement your electrical safety plan, you’ll want to start thinking about Documentation Methods, Evaluation and Corrective Action.